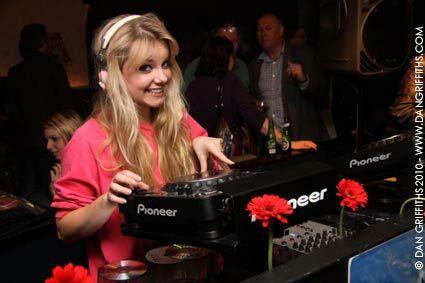 This photograph of DJ Goldierocks (Sam Hall) was taken at the launch of Latitude festival 2010. The launch took place on Tuesday night at the Hotpital club in London. Goldierocks will be DJing at this year’s festal and will appear alongside Florence + The Machine, Belle and Sebastian, Vampire Weekend, Empire of the Sun, The Maccabees amoung others. For more info on the festival check out the official Latitude website.